Identity verification solutions are just as important in a call-center environment as they are online. Delivering a satisfying customer experience on the phone can be a make-or-break opportunity for many organizations. Whether companies are dealing with new or existing customers, if they trust you today, they will do business with you tomorrow. However, as incidences of identity theft and fraud continue to rise, it becomes even more important for organizations to establish new and innovative ways to protect customer identity and convey trust. When it comes to a call-center environment, utilizing dynamic KBA – knowledge-based authentication is an effective way to verify a customer is who they say they are without putting your business or your customer’s privacy at risk. Dynamic KBA works by presenting a series of fact-based multiple choice questions which only the person being verified can answer. These questions are dynamically created and do not require a previous relationship with the consumer. Click here to understand more about dynamic KBA. For more information on how to improve your call center performance, download our whitepaper here. TechValidate, a third party research organization, recently conducted a survey of our esteemed customer base. 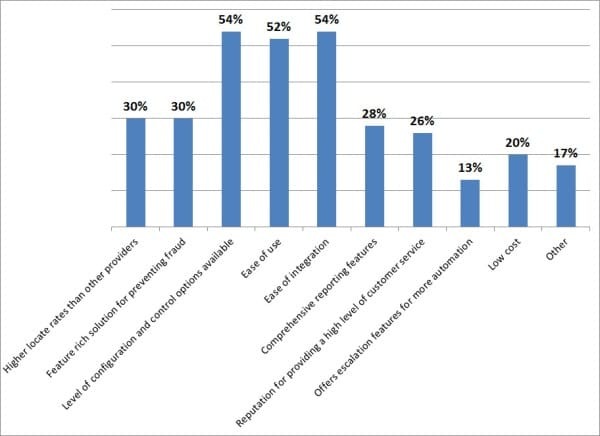 33% of organizations surveyed have deployed IDology’s identity verification platform into their call centers (Source: Survey of 45 users of IDology ExpectID. View the validated response here).